Our PE Coating aluminum composite panel adopts aluminium material from Southeast Aluminum Group, a leading aluminium sheet and coil manufacturer and supplier in China, so the panel quality is guaranteed. After surface treatment, the aluminium composite material is coated with HYLR5000 paint. This creates a PE coating which features good color retention, high mechanical strength and high peed strength. So, our PE coating aluminum composite panel is a convincing choice for building protection and decoration applications. The length of our PE coating ACP can be made according to customers' demands. 1. The PE coating aluminum composite panel features superior flatness, due to our adoption of advanced production lines. 2. 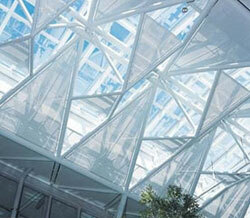 The adhesive film is made from raw materials acquired from DOPONT, which guarantees good peeling strength. 3. We have different types of raw materials in stock. Hence, we can produce products according to customers' demands upon receiving orders and this also helps ensure goods delivery in 15 days. 4. Since we have a scientific management system to control our production cost, we are able to provide our PE aluminium composite panel at competitive prices. 5. As an experienced aluminum ACP manufacturer in China, we provide customers with 5-8 years color quality warranty on our aluminum composite panel and 15 years warranty on panel construction quality. As a specialized PE coating aluminum composite panel manufacturer and supplier in China, Litai Ornamental Materials Company provides a great number of other types of architectural decoration panel, such as mirror ACP, advertising ACP and so on. Due to reliable performance and low prices, our aluminium composite panel is well received by customers from America, England, Canada, Spain, Holland, Brazil, Mexico, and India, to name a few. If you have any need on our aluminum composite materials, please feel secure in contacting us.